Nineteen original tales of the pandora legend-as no one has ever imagine it before. When Pandora’s Box was opened, so the ancient tale goes, all the evils that would beset humanity were released into the world. When the box was all but empty, the only thing that remained was hope. Now some of fantasy’s finest writers have taken on the task of opening Pandora’s closet. It is naturally chock full of an assortment of items, including a ring that can bring its wearer infinite health, a special helmet found in the most unlikely of places, a mysterious box that holds a legendary piece of cloth, and a red hoodie that transforms a woman’s world. These stories are of items claimed by people, but only at their own peril. 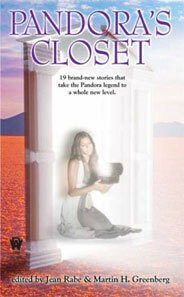 After indulging in these stories, readers will certainly look at their own closets in a whole new light.